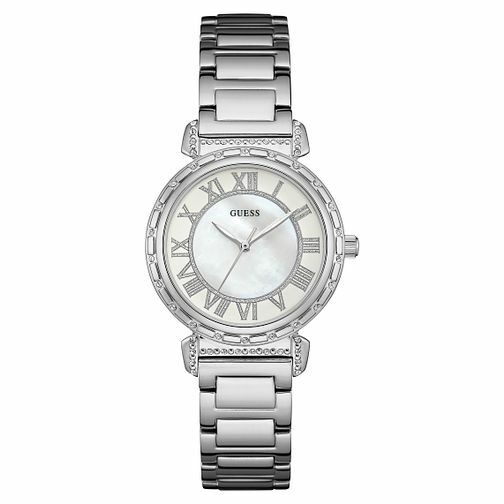 This fashionable ladies' watch by Guess is the perfect choice for any fashion-forward female. It features a luscious mother-of-pearl dial, with glittering roman numeral markers. Combined with the intricate stone detailing and radiant stainless steel bracelet, this watch was made for all outfits and occasions. Guess Ladies' Stainless Steel Bracelet Watch is rated 4.7 out of 5 by 3. Rated 4 out of 5 by Anonymous from Quite Good The watch face is elegantly designed and provides a light feel on the write whilst giving off the impression of a slight bigger yet delicate watch however the strap although metal feels like plastic and cheaply made and therefore i cannot give it the full 5 stars. Rated 5 out of 5 by Anonymous from Very nice Very good quality, happy with the purchase. Would order online again.